Punti Necessari: 3550 Please note that, for now, you cannot download content from our platform directly onto a mobile device (phone, iPod, iPad, tablets...). You need to download your items onto a PC or Mac, and then transfer them onto your device in the normal way. We are working on allowing direct downloads to mobile devices but this is not possible in the current version of the platform. Sorry about the inconvenience! NOTICE: Activation key must be used on a valid Steam account, requires internet connection. ABOUT THE GAME	Face your fears, or face death. There is no escape. A zombie outbreak eradicated all hope of returning life back to normal, now only survival lives on. Run, hide and fight your way through the undead as Randall searches for his family in this gorgeous, gritty, destroyed world. 'Set in… an apocalyptic 1986, the survivors of a zombie outbreak live on among the remains of human civilization, trying to survive this hell on earth by any means necessary. You play Randall Wayne, an introverted and slightly paranoid survivor searching the destroyed streets of Seattle for his loved ones. Through tense platforming and life-threatening zombie encounters you must decide whether to use scarce ammunition and weapons to decimate the horde, or navigate the environment to sneak past them and hide. There’s more than one way to survive against the walking undead remains of the human race, now known only as ‘shadows’. 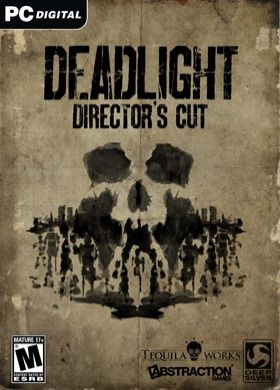 Deadlight: Director’s Cut enhances the original Deadlight in every way. Improved visuals and textures bring even more detail to the remnants of Seattle, plus enhanced controls and new animations make Randall even more agile. Now you must fight for your life and put your survival skills to the test in Deadlight: Director’s Cut new game mode, the ‘Survival Arena’.KEY FEATURES	Solve environmental puzzles and overcome hazards in tense platforming while trying to stay out of the shadow’s grasp. Combat isn’t always the answer. To truly survive you must use your environment to sneak past, trick and lure enemies into traps. Assess every situation to increase your odds of survival. Uncover the fate of Randall Wayne’s family in his search across an apocalyptic Seattle in the year 1986. Enhanced controls and new character animations make Randall more agile and easier to control than ever! Endure Randall’s toughest challenge yet in the new ‘Survival Arena’ mode!SYSTEM REQUIREMENTS Minimum OS: Microsoft® Windows 7/8/10 – 64bit Processor: Intel Core 2 Duo 2,4GHz+ or better Memory: 2 GB RAM Graphics: 512MB video card with Shader model 3.0 support DirectX: Version 9.0c Storage: 5 GB available space Sound Card: DirectX 9 compatible sound card Additional Notes: Supports Microsoft® Xbox 360 controller Recommended OS: Microsoft® Windows 7/8/10 – 64bit Processor: Intel Core 2 Duo 2,6GHz+ or better Memory: 2 GB RAM Graphics: Nvidia GeForce GTX 550Ti or better, AMD Radeon HD7750 or better DirectX: Version 9.0c Storage: 5 GB available space Sound Card: DirectX 9 compatible sound card Additional Notes: Supports Microsoft® Xbox 360 controller © 2016 TEQUILA WORKS, SL and published 2016 by Deep Silver, a division of Koch Media GmbH, Austria. Deep Silver and its respective logos are trademarks of Koch Media GmbH. Deadlight, Tequila Works and their respective logos are trademarks of TEQUILA WORKS, SL. Developed by Abstraction Games B.V. All other trademarks, logos and copyrights are property of their respective owners. All rights reserved.